In this collection of speeches and essays (some reprinted from the New York Times, Parade, etc. 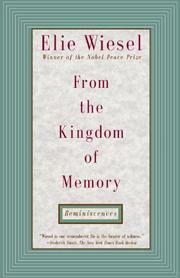 ), Wiesel pleads passionately for preserving the integrity of memory and language in order to restore meaning to human life and its essential human attribute, language. The Nobel laureate seeks to pierce the screen that separates words from their meanings and keeps people from realizing their dreams and learning from their memories. Over and over, he underlines that language and memory are the only tools we have to help us to acknowledge and formulate the right questions about the abyss that separates us from Holocaust survivors. Admitting the inadequacy of words to bridge the gap, he says, brings us closer to the terror and the truth at the heart of ourselves and our history. Especially moving are accounts of Wiesel's return trips to the scenes of his torment, "Pilgrimage to the Kingdom of Night," "Pilgrimage to Sigher," "Making the Ghosts Speak," and his uncompromising addresses to President Reagan, the Reichstag, and the Nobel audience. Also included are the classic essay "Why I Write"; a shattering memoir inspired by the trial of Klaus Barbie; and dialogue sketches and other pieces. Wiesel continues to speak of shameful and painful events in human history, wounding and enlightening at the same time.